Seller says bring offer now. 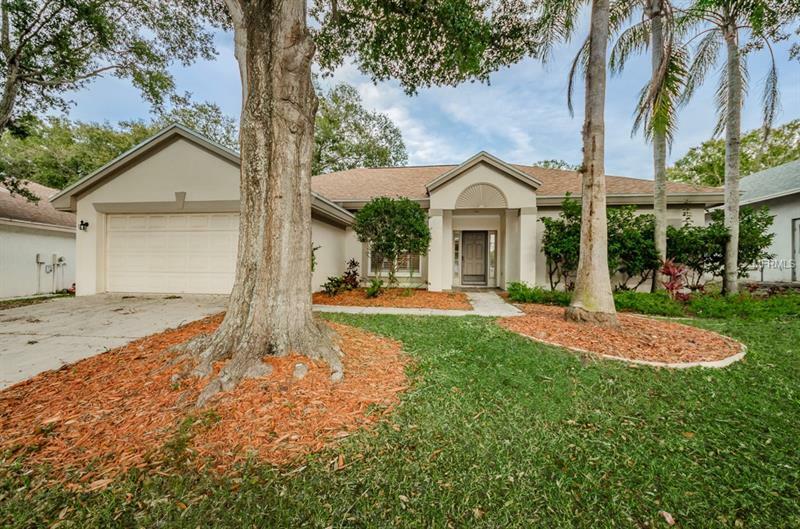 Located in highly desirable Groves of Cobbs Landing in the award winning "A" rated Palm Harbor school district, this move-in ready updated home awaits you. Boasting a brand new roof, newer AC, new pool resurfaced, brand new stainless steel appliances and much more. Gleaming hardwood flooring highlight the large living and dining rooms with volume ceilings. The chef of the house will adore the kitchen with new stainless steel appliances, center island, breakfast bar, pantry, planning desk and eat-in area with access to lanai and pool. Entertaining or relaxing is made easy in the expansive family room featuring volume ceiling, a fireplace, ceramic tile flooring and triple sliders to the screened in pool area and fenced yard. Retreat to the master suite with gleaming hardwoods, volume ceiling and a large walk-in closet. The master bathroom offers dual vanities, separate glass shower and soaking tub. You will also enjoy two spacious bedroom, bathroom and small office. The covered lanai includes three fans and opens to the freshly painted patio and resurfaced pool and hot tub in the screened enclosure. Complete with fenced yard, freshly painted and much more. Minutes from award winning Honeymoon Island and other inviting beaches. This home is blocks from "A" schools and shopping, grab a slice of Florida living today. View Virtual Tour for additional photos.